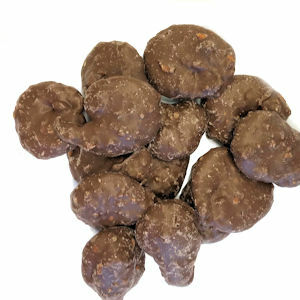 These bite sized pretzel bits are salty pretzel pieces and bits of buttery toffee drenched with creamy milk chocolate. A great snack to indulge your sweet tooth and the perfect cure for a sweet and salty chocolate craving. Milk Ingredients: Milk Chocolate [Sugar, Milk, Cocoa Butter, Chocolate Liquor, Soy Lecithin (an emulsifier) and Vanillin (artificial flavor)], Pretzels (Wheat Flour, Salt, Corn Oil, Malt Syrup, Sugar, Yeast and Soda), Sugar, Butter (Pasteurized Cream, Salt and Natural Flavoring), Corn Syrup, Salt, Sodium Bicarbonate, Soy Lecithin and Tenox BCH.